Honda Civic Type R Mugen | What Car? The most exclusive Honda road car ever has been cleared for production next spring at an exclusive price. Only 20 examples of the Civic Type R Mugen will ever be made. All are destined for UK customers willing to splash out at least 38,599. Mugen, the Honda-owned independent race engine tuning company, will hand-build the cars at its base in Northampton from standard Civic Type Rs made in Swindon. With the power of the regular 2.0-litre engine increased by 20% to 238bhp and torque raised by 10% across the rev band, the Type R Mugen will be the fastest non-turbo front-wheel-drive car in the UK. The standard Type R's weight has also been shaved by 20 kilos, so that each one of those 238bhp has to move only 5.5 kilos compared with 6.7 kilos in the regular production model. Mugen has also shortened the throw of the six-speed manual gearbox, retuned the suspension to improve traction, uprated the brakes so that they resist fade even after an hour's track use and fitted aluminium 18-inch wheels to trim unsprung weight. There are also aerodynamic changes to increase downforce, dominated by a large additional wing at the rear. The result is a car that feels sensational on a race track, but that also makes a plausible everyday road car. Every minute action by the driver produces an instant reaction from the car, and the engine is as smooth and tuneful as you'd expect from something hand-built by a race tuning company. 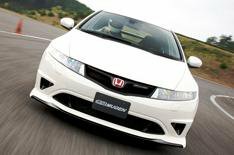 The car is based on the super-light, two-seater Type R Mugen Concept model that Honda has been touting around to gauge reaction. The UK has been singled out to get exclusive access to it because it is the world's leading market for the Type R.
Each car will take a working week to complete, but Mugen expects it will be more than six months before all 20 are finished. That explains a price that's almost double the 19,995 of the 198bhp Type R GT. The price goes up if you opt for the 'track pack' of competition front seats, extra instruments and further weight reduction which includes the removal of the rear bench. If you think that's steep, though, bear in mind that the engine is built with the same precision as a full Type R race unit and they cost around 16,500 before VAT. Let What Car? 's associate editor, Roger Stansfield, take you for a lap in the Mugen-tuned Civic Type R. Just click the play button.